Self Catering Accomodation at Consac, Charente-Maritime, France. Consac, is a rural village in the Haute Saintonge district of Charente Maritime. Furnished self catering accommodation for 4 people, ideal for touring, and holidays. bathroom and Separate WC; washing machine. An old renovated house, cool in the summer and heated by gas in winter. In the village: bakery, adventure playground for children and tennis within 200 metres. Pond for Fishing, snack bar and meals available 1 km - Visit the fish breeding of ornament at Consac. Outdoor swimming pool at Mirambeau is 4 Km - Horse Riding at the stables of St Antoine is 10 Km. Jonzac is 15 Km : Thermal baths + Complex water of the "Antilles", for relaxation. 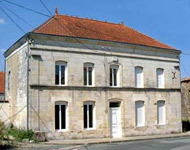 Natural pole of Vitrezay is 15 Km - In Northern Gironde at Blaye, Vat towards the Medoc is 40 Km. The beaches of Meschers/Gironde are 40 Km. Royan, zoo of Palmyre, and the "Côte sauvage" are 50 Km. The Romanesque heart of Saintonge, between heaven and earth. Charges are inclusive of Electricity & Gas & all Taxes. Bed linen and towels are provided. A deposit of 30% is required at the time of the reservation*, and balance on arrival. Nathalie or Jean Michel de Poix, (English spoken) - 6, impasse des noyers - 17150 CONSAC. The periods in red are currently reserved. Use the arrows below to make ravel the calendar. towards the PayPal site which you will receive by email. Au détour d'un chemin creux, on découvre cet ancien four à pain qui marque l'entrée de cette jolie propriété nichée au creux d'un vallon paisible. (Charente - 16) "Le hameau de la Brousse" est un gîte de séjour qui vous propose chambres et table d'hôtes, ou gestion libre. Il se situe en Charente, aux portes de la Dordogne, à proximité d'Angoulême, Cognac et Périgueux. Il propose stages et séjours pour les vacanciers. L'association Ciel ouvert y organise spectacles, animations, résidences. Une jardinière, une céramiste, une peintre et un sculpteur habitent sur place et proposent visites et activités de découverte.